The four elements of NASA’s Earth Science Division (ESD) ― Flight, Research and Analysis (R&A), Applied Sciences (ASP), and the Earth Science Technology Office (ESTO) ― work together from mission concept to conclusion to both enhance existing Earth observations and find new ways to analyze our living planet. 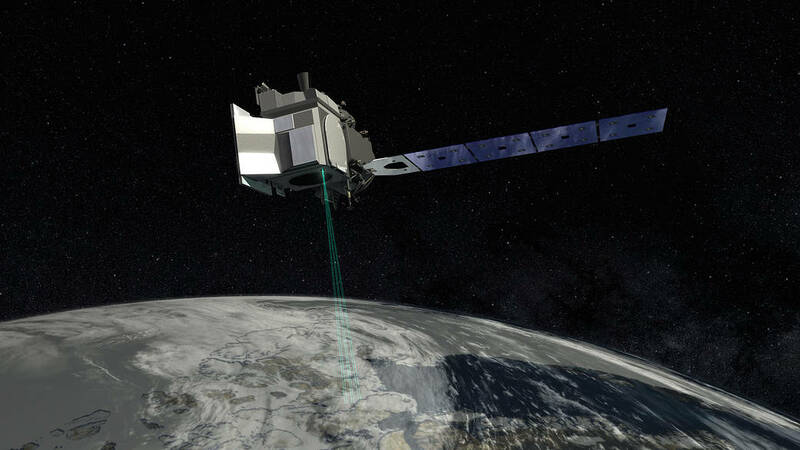 NASA’s Ice, Cloud and Land Elevation Satellite-2 (ICESat-2) uses split-second laser pulses to measure the height of Earth’s ice sheets, glaciers, sea ice, vegetation and more. You can learn more and watch videos about ICESat-2 on its website. The Flight Program team builds and operates the satellite and airborne missions that deliver critical data to the world’s science community. Flight mission development ― from advanced concept studies, to flight hardware development, to on-orbit operation ― is managed within the Earth Systematic Missions (ESM) and Earth System Science Pathfinder (ESSP) Programs. Earth Systematic Missions (ESM) Program develops satellite missions to help understand Earth’s response to natural and human-induced changes. Set and directed by NASA, these expanding missions provide invaluable insight and climate data records. Earth System Science Pathfinder (ESSP) Program competitively selects low- to moderate-cost projects that focus on emerging scientific priorities and measurement capabilities. This includes Earth Venture projects that develop new instruments, conduct airborne and field research, and build satellites for full mission engagements. The Flight Program also encompasses the crewed and robotic aircraft campaigns of the Airborne Science Program, which observes Earth’s changes, obtains data for modeling activities, tests and refines new instrument technology, and calibrates satellite instruments. In addition to managing scientific investigations, Flight also oversees a dozen data centers around the country that each day archive 16 terabytes and distribute 32 terabytes of information products. The Earth Observing System Data and Information System (EOSDIS) acquires, preserves and distributes data from spacecraft and field campaigns to support Earth science research worldwide. 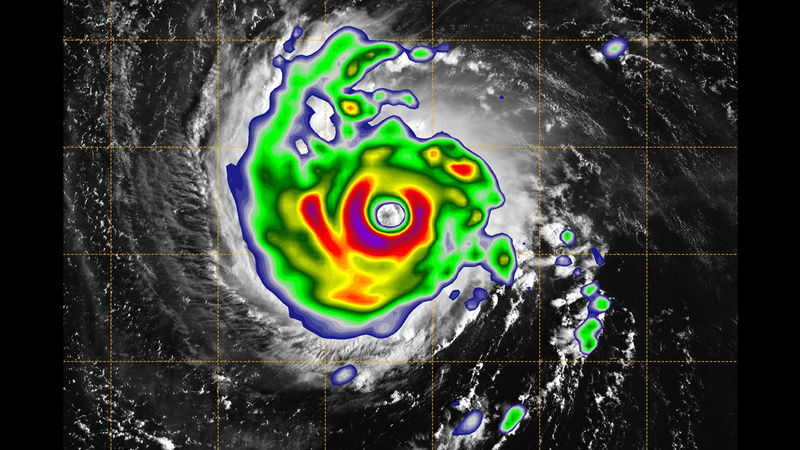 NASA’s Global Precipitation Measurement (GPM) core observatory satellite flew over Hurricane Florence in September 2018, capturing a 3D image as the storm’s clouds started to break apart before reforming. Read more about the objectives and applications of GPM online here. Scientists in the Research and Analysis Program (R&A) use satellite observations, data collected by airborne and land-based missions, and computer modeling to turn measurements into understanding about the Earth system and interaction between processes. R&A supports scientific investigations within NASA and at universities, competitively selecting the most compelling and significant Earth science research. Competed Individual Investigator Science. R&A supports individual investigator science within disciplinary based programs related to six key focus areas; interdisciplinary and cross-disciplinary programs that cut across traditional boundaries; competed science teams for NASA missions; and field campaigns that integrate surface-based, airborne and satellite observations using large-scale models. Enabling Capabilities. Another major component of R&A is its support for the physical and technical aspects of Earth study. This includes: maintaining a fleet of aircraft and associated systems; maintaining and operating high-end computing systems that support Earth system modeling, data assimilation and large-scale data analysis; providing the capability that supports and complements NASA’s satellite program; and maintaining and developing modeling systems for use by the entire scientific community. 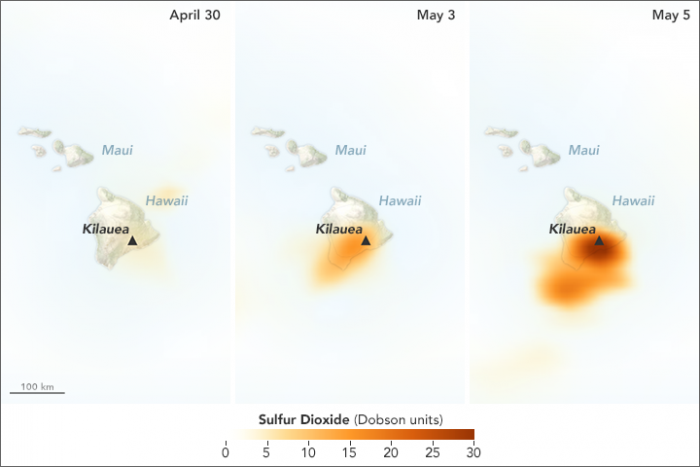 The Ozone Mapping Profiler Suite (OMPS) on the Suomi-National Polar-orbiting Partnership (NPP) satellite shows a dangerous increase in sulfur dioxide coming from Hawaii’s Kilauea volcano from April 30-May 5, 2018 as a major eruption took place. Read more about the 2018 Kilauea eruption and how NASA helps response and recovery efforts around natural disasters. The Applied Sciences Program (ASP) leads and supports programs that turn NASA Earth science data into focused information products that inform crucial decision-making for disaster relief, agriculture and water resource management, health and air quality, and other fields that benefit society. Earth science observations are used in disaster prediction, response and recovery in the event of floods, earthquakes, volcanoes, landslides, wildfires and other natural catastrophes. They are crucial to ecological forecasting and resource management, including managing water supply, demand and quality. Applications for Earth science also include managing air quality and public health issues such as infectious diseases. The ESD Applied Sciences Program also helps build the science leaders of the future through development and capacity building programs that train and support individuals using Earth observations for the public good in developing nations and around the world. The Earth Science Technology Office (ESTO) takes on the technical challenges of Earth observations by funding, developing and demonstrating cutting-edge technologies that can be reliably and confidently applied to a broad range of Earth science measurements and missions. From next-generation sensors and instruments to communication systems and computer modeling, ESTO technologies enable new observations of our home planet and new insights about Earth’s natural systems. ESTO-funded technologies also regularly lead to spin-off or commercial applications that benefit society overall. Through flexible, science-driven technology strategies and a competitive selection process, ESTO has engaged more than 120 institutions, universities and corporations nationwide to build a broad portfolio of more than 800 past and active investments. Instrument Incubator Program (IIP) develops robust measurement techniques and instruments that are smaller, less expensive and lower the risk of building space-ready scientific instruments. Advanced Component Technologies (ACT) focuses on the critical components and sub-systems needed to support Earth-observing scientific instruments. Sustainable Land Imaging Technology (SLI-T) develops technology specifically designed to reduce the cost and risk of future land imaging (Landsat) measurements. Advanced Information Systems Technology (AIST) develops innovative ways to utilize data through its lifecycle, from generation to analysis. This leads to increased uses and better understanding of remote-sensing data and model output which, in turn, results in new measurement and data products. In-Space Validation of Earth Science Technologies (InVEST) tests instruments in orbit to confirm their effectiveness and to reduce risk, which is vital for small instruments and instrument systems that could not otherwise be fully tested on the ground or via airborne systems.